First things first, I have an embarrassing confession to make. This is that despite my shrieking over the past couple of weeks, I've been woefully misinformed and The Raven King does not, in fact, come out till next month. I saw the date ages ago -- the 26th of April -- but somehow got it into my head that it was the 26th of March and ran with that. If I've given you false hope, I apologise. Thanks to Cait for pointing out my error! Because, seriously, I was going to get up early this morning and get a train into town (at the cost of £5.20 to my good self) and walk up to Waterstones, brandishing my £7.99. Then my disappointment would have been bitter indeed. Only some shred of integrity as a blogger is preventing me from returning to my previous posts and deleting my false statements. So that is a lesson to us all: always check your facts before posting things on the internet! Moving (very) swiftly onwards, I'm here with my Starting Sparks story. Starting Sparks is hosted by Ashley and me, and it's just what it says on the button. For more information, hop up to the Starting Sparks tab. This month I'm returning to the Ruskins. As you probably know, I'm writing a high fantasy trilogy, but I have a contemporary forming in my head about four siblings from Surrey. It is well past the foetal stages -- it has grown arms and legs and indeed wings and when said trilogy is done, it's clamouring to be written. My working title is A Room Alone. If you go to the page I Write (up at the top there) you can see two other Ruskins posts. One, In Rain, is a general introduction to the family, although details from it have now changed. 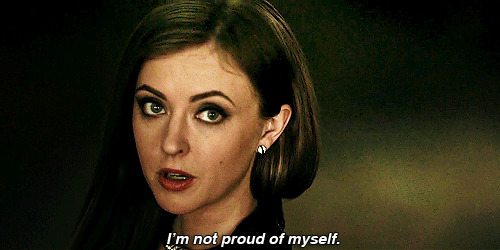 The other, A Room Alone, develops the character of Teresa. To refresh you: we have four Ruskin children, Matthew, Teresa, Felicity and Edmund. 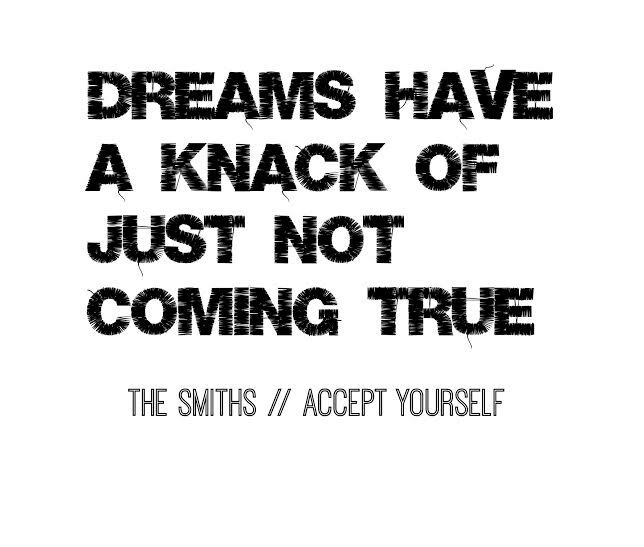 These are lyrics from Accept Yourself by the Smiths. The four Ruskins are very different and don't always get on swimmingly, but one thing that brings them together is their love of The Smiths. If you don't know, they're a famous British band; loving them is something of a British teen's rite of passage. Recently I've been listening to the album Hatful of Hollow a lot, and the theme of dreams that runs through it inspired me. It's basically a perfect album. It is extremely funny. Many of the songs are very painful, and yet Morrissey (the frontman) is always laughing at himself. The sound of the songs is quite upbeat, but often that conceals an upsetting undertone. This theme of appearances vs reality is really important to Matthew's story and character arc. I shall now make some introductions. Matthew Ruskin is 21 and a third year medical student at Glasgow University. He is an artist and his family (who are all literary/musical/dramatic/artistic) always expected him to go to art school. He has kind of rebelled against them by choosing medicine, and also by his choice of Glasgow, which is galaxies away from their upper class Surrey bubble. Yousef Haseeb is 20, also a third year medic, Matthew's flatmate and best friend. He's a second gen Pakistani Glaswegian and a Christian. Alyssa Major is 20 and Yousef's best friend from school. She's in second year at Glasgow School of Art. Charlotte Fitzmaurice is 21 and from Kensington. She has not informed me of her degree. She's a friend of Matthew's though as yet I don't know how they met. The song: listening is not compulsory but the characters do sing the words to each other, and also it's a wonderful song, so I would recommend. The ceiling was low and the darkness thumped with the bass. Somebody crashed into Matthew from behind, sending half his drink lurching to join the sticky pools congealing on the tiles. “All right, big man!” the boy shouted and wheeled away. Matthew pushed through the bodies to where Yousef leant against the wall, laughing at his friend’s face. Matthew grimaced, blinking in the bands of green strobe lighting. The room was packed, some dancing, most standing in circles and yelling to be heard. Figures were silhouetted clutching drinks, girls hugging and posing for selfies. His eyes flicked across, pretending he wasn’t looking for anyone in particular. “Ruskin and Haseeb!” A trio of boys lurched towards them in a hail of back-slapping. They all looked the same, Matthew reflected: black sports jacket, low-slung jeans, Nike trainers. Hair shaved at the sides and gelled on top, worn with an inane expression. They brayed with laughter and veered off. Yousef made a face at Matthew. He shrugged. “I’m all right.” His eyes were travelling through the crowd. He too was looking for someone. Matthew looked at the sea of people, bouncing to the beat of the drums. Did they realise that this was not music, that there were no drums, no instruments or voice, just a man in a booth turning dials to make this chart-topper? That this pseudo-song was as synthetic as the Hollister they wore? Did they consider, as they uploaded snaps to Instagram, that they too were particles in a vortex of mindless noise? He frowned into his drink. It was barely eleven and he was having an existential crisis. This was Teresa’s division, or Edmund’s, not his. Matthew laughed. He waded through conversation like a sea creature through oil, slapping on his smile with a mime artist’s skill, returning again and again to Yousef as one to an oasis in the desert. The walls were sweating and Matthew reflected he was perhaps more drunk than he thought. Yousef was sober, his eyes still searching the mass. It was the music, Matthew decided, the music that made or slayed the party, and that wasn’t just a Spotify ad talking. As the night deepened he sensed a change, fewer of the mind-numbing dance tracks. When the Smiths came on he raised his hands in adulation. “When will you accept yourself?” Matthew sang. Yousef started to laugh, and his eyes widened and he swallowed, a smile rising that was not for Matthew. Like the proverbial clouds the crowd had parted, and a girl was dancing with her arms above her head. She looked up and saw them and her face lit up. She waved, an exaggerated Over here! She wrapped her arms around Yousef, still singing into his shirt, “Dreams have a knack of just not coming true!”, and he returned the hug with a bemused smile. Alyssa broke away and beamed at Matthew. They were hardly close, but the guitar – real guitar, Matthew rejoiced – strung them together, singing the words to Yousef. She hugged Matthew, a hug full of her frenetic energy, and he found himself dancing as if they were best friends. Alyssa Major: Yousef’s best friend from school, a student at the Glasgow School of Art, the path Matthew could have chosen, had things been different. In the three years he’d studied in the city, he had found Alyssa problematic. She was a firebird with a broken wing, a kitten let loose in the jungle. She was loud, brash, the opposite of his Surrey upbringing. She was unreliable, immature, and many times he’d watched Yousef’s face fall as the casual text flew in, bright with emoticons, cancelling yet another plan. Matthew had resented Alyssa. But, with alcohol and good music, he could forgive a lot. Yousef didn’t know the song. His dancing was supremely uncomfortable. “When will you accept your life, the one that you hate?” Alyssa sang at him. Her words were lost in the noise, and, not hearing her, he smiled. The song was deceptive, heartbreak concealed by beat and major chords. When it was over they trooped outside, laughing, giddy. The comparative silence of the street was a blessing. Alyssa fell against the wall, fumbling with her lighter. “Smoking kills,” Matthew informed her. “Not quite yet,” Yousef said. “Have a positive mindset! Live in the moment, be mindful …” She collapsed into laughter. Yousef steadied her to stop her from falling. In the orange streetlamp her blue hair was an unhealthy green. Her mascara was smudging, black rings beneath her eyes to match the blue shadows of tiredness. Her face was pink, perhaps with cold, giving her the look of feverish intensity she always carried. “I like you, Matthew,” Alyssa addressed him. “I don’t really know you but I like you. I like how posh you, it’s funny …” More laughter, and Matthew laughed with her, confused late-night laughter of the sort that can lapse into tears. Alyssa blew rings of smoke across the street. “I might have to redo second year,” she said. “They say I’m not working hard enough, they don’t understand that I’m a tortured artist … it’s my creative process …” Laughing, leaning into Yousef. “Your work’s too brilliant for them,” he said into the top of Alyssa’s head. There was a catch in his voice that made Matthew look up. “Let’s look at the stars and think deep thoughts,” Alyssa said. “I bet it does, if we try …” Matthew watched as she led him away. Laughing, partway down the street, Yousef was picking her up, pointing past the sandstone buildings. There was a glimmer of something about them, a glow, and suddenly Matthew felt oddly sad. Alyssa was laughing at something Yousef said, one arm draped across his shoulder. A voice behind him said his name. He turned, a shock of heat blooming through him. He had been waiting, there was no denying it, waiting for something he was half afraid to want; and there she was, Charlotte Fitzmaurice, as appropriate for the drunken Glaswegian night as a dove in a skyful of ravens. His heart was racing, he could hardly say why, and she shone in the streetlight like a spirit ministering to the world below. “I – yeah,” said Matthew. The alcohol was not making him brilliant, rather wrapping his thoughts in a dull fuzz through which she shed golden and confusing light. His mouth was dry. Charlotte laughed, a short hard sound like a diamond. She was wearing a white dress, completely steady in her heels. Matthew was conscious of the cold, but she stood impervious, the tsarina of her own kingdom. She had a class and a glamour lost decades ago. He could imagine her in an old Hollywood film, tapping ash from a silver cigarette holder. The Bond girl, blonde, stunning, icy English beauty with the wild streak of the unknown inherited from her French mother. Matthew had heard her speak French on the phone, her coolness tempered by the flare of the foreign, a promise of something untold. Matthew’s brow creased, presented with the choice of defending one girl or impressing the other. In the fog of his mind the options were uncertain. Charlotte read him, deftly, with a glance. The door of the club opened, spilling Hollistered boys clutching their Smirnoff bottles like trophies. They surged down the street, shouting to each other. “I hate this city,” Charlotte said. “Wow,” he said, unable to think of anything else. Matthew laughed, very conscious that she had moved towards him as she spoke. He could smell her perfume, like her, heady yet sharp. Matthew couldn’t swallow, the orange of the streetlamps colliding like stars in his vision, Charlotte rising in an electric haze like Aphrodite from a lightning storm. She kissed him, the goddess beneath his hands, sparks showering in the Glasgow night like fireworks on a black sky. Matthew was breathless, everything forgotten, sure in a moment of clarity that this was it, it had all been building to this night in this street at this misty, untellable hour. She kissed him, again and again, such a woman as he’d never seen; the climax of the film, the moment the audience longed for, and here he was, lead actor, hero. When he looked into her face she was smiling. Matthew wanted to hug her, folding her against him, affectionate; he wanted to talk to her, for hours perhaps, make her laugh, find out everything that made her such a glorious mystery. Charlotte waited for him to do neither of these things, but let go of his hand with a brush of the fingertips. “Goodnight, Matthew,” she said. She walked away with assurance, a glimmer fading into the grey night, and Matthew shivered in the sudden cold. He was left staring at this hands, the hands she’d touched, unconscious of the smile on his face. Matthew jumped. The world had retracted, leaving just the two of them, but here was Alyssa, grinning with nicotine-stained teeth. Yousef caught Matthew’s eye and raised an eyebrow. “Well?” said Yousef, handing him the tea. With anyone else he would have brushed it off, a shrug, a laugh, it’s no big deal. Perhaps he’d have pretended he kissed girls like Charlotte all the time. But Matthew knew, and Yousef knew, that there were no girls like Charlotte. “I’m delighted,” he said, and started to laugh. I definitely knew people like Charlotte while I was in college, especially when it comes to the mindset of a school that could be seen as "less than", or in a smaller town/city. Great post - glad to see more of the Ruskins. I know, so do I!!! Oh, I like this! Matthew seems interesting. Him and his existential crisis. XD Yeah, I think I'm always at least half in an existential crisis. He sounds like he's used to being level headed. I've never been drunk, but the way you describe him and the others being drunk feels realistic. I also like how Matthew was a rebel by choosing medicine instead of art. Usually, it'd be the other way around. It's a nice twist. :D The loud, rowdy party was kind of how I imagine parties to be. Charlotte is very interesting too. I know, bless him. He's not normally the existential crisis type XD Nor me, but I think I did it justice. I have one friend in particular who always requests when drunk that we think deep thoughts -- Alyssa at that moment was a direct lift from her! I love heisting true lines from life and inserting them in writing! It makes it feel more real. Especially if it's just little details. Charlotte does seem kind of. . . I don't know. She seems like someone whose allure would make me more distrusting of her. You know, those people most everyone likes but you take one look at them and know they are trouble. Hmm. I don't know whether everyone likes Charlotte? Matthew and many other males obvi fall over themselves around her, but I don't think she inspires worshipful devotion from nice girls. I think she's more the Regina George of her Mean Girls, ie all her friends are just like her, and they all kinda hate each other. That's definitely true. When she lived in Kensington she went out with millionaires' sons and shopped with millionaires' daughters, but she hated all of them deep down. I'm not sure which of the characters like her apart from Matthew, though. Yousef doesn't really, but he's happy if Matthew's happy. Alyssa definitely doesn't because Charlotte's not nice to her. I wish I could listen to the video you provided, but I'm sitting in a quiet space on campus and I don't have headphones. I'll have to come back when I get home! Thanks for sharing it; it sounds awesome! I'm so embarrassed, oh my gosh! No worries about the Raven King, I got it wrong too. I love your writing, Matthew is a gem. Loved the britishness of it all, and The Smiths. They're really good. Thanks XD ONLY 27 DAYS AND THIS TIME I'M RIGHT! Thank you, Skye! He is a babe, I just wish he'd make better choices, bless him.